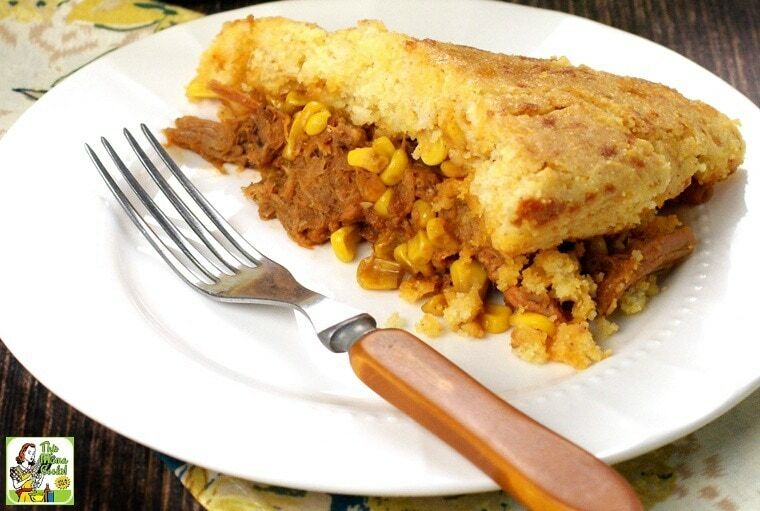 If you’re looking for quick and easy dinner ideas, try my Pulled Pork & Cornbread Skillet recipe. 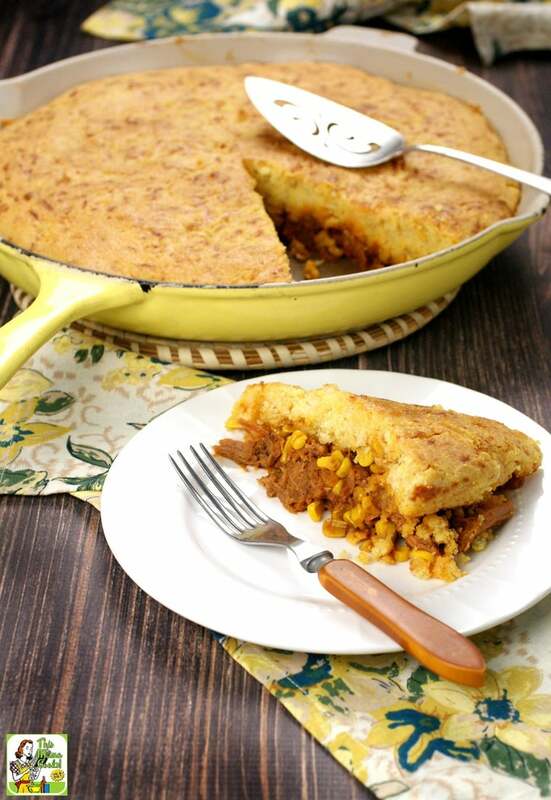 It combines all your BBQ favorites – pulled pork, cornbread, and corn – right in a skillet! This quick and easy dinner is made with Farm Rich Smokehouse Pulled Pork BBQ. Labeled gluten free right on the front, Farm Rich Smokehouse Pulled Pork BBQ is minimally processed, has no preservatives, and no hormones added. You can find it in the freezer section of your grocery store. Having a few packages of Farm Rich Smokehouse Pulled Pork BBQ in your freezer beats driving out to your favorite barbecue place! It makes cooking up delicious one skillet dinners a breeze, too. I love having barbecue with corn bread. Luckily, there are now some terrific gluten free cornbread mixes on the market. My favorite is Krusteaz Gluten Free Honey Cornbread Mix, which isn’t too sweet. I also wanted to add some veggies to go along with the pulled pork filling. My kids love corn, so I thought a bag of frozen corn would be perfect. I love using frozen vegetables since they’re so convenient and nutritious. These days you can “steam” frozen vegetables by microwaving them right in the package. 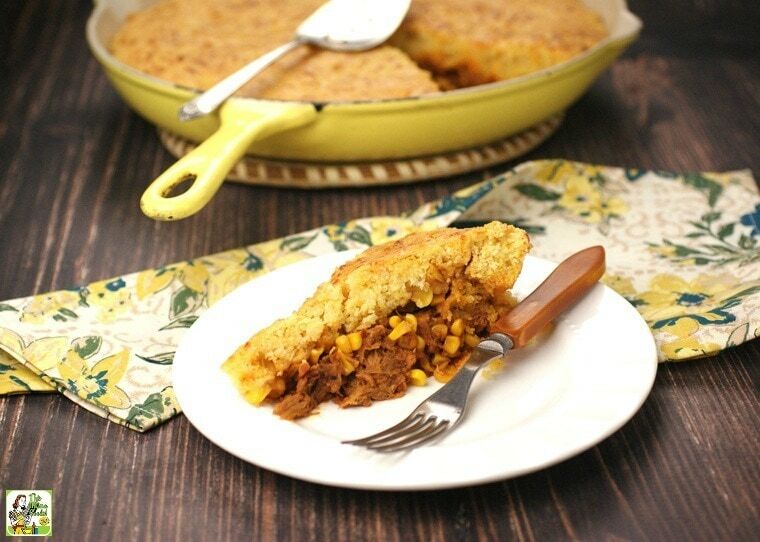 That makes this Pulled Pork & Cornbread Skillet dinner even easier! The beauty of one skillet dinner recipes like this one is that it took no time at all to put together – 20 minutes prep and 30 minutes cook time. What I also like about this Pulled Pork & Cornbread Skillet dinner is that I always have eggs and shredded Mexican cheese in my refrigerator (with extra bags in the freezer). It’s easy to keep extra bags of corn and Farm Rich Smokehouse Pulled Pork BBQ in the freezer, too. Buy a few extra boxes of the Krusteaz Gluten Free Honey Cornbread Mix and you can quickly make this flavorful one skillet dinner recipe up any weekday evening. My kids are crazy about this quick and easy dinner. I find that my son, Nathan, loves to have slices of leftover Pulled Pork & Cornbread Skillet for breakfast and lunch, too. For variety, you can try mixing some corn into the cornbread, try a spicy pepper jack cheese instead of the shredded Mexican four cheese blend, or use another kind of frozen vegetable instead of corn. Like skillet cooking? Then you'll love this Easy Nachos Recipe made in a skillet and this Easy Cast Iron Skillet Cornbread recipe. Place gluten free cornbread mix, water, canola oil, egg, and cheese in a medium bowl. Stir until well blended. Set aside. Place bag of frozen corn in microwave and heat for 2 to 3 minutes, just long enough to separate kernels of corn. (From frozen) Remove outer carton of Farm Rich Smokehouse Pulled Pork BBQ, lift corner of film tor vent and place tray on microwave-safe plate. Microwave on HIGH 4 minutes. Carefully pull back film, stir, and break up any large pieces of pulled pork. Take a 12-inch oven safe skillet and spray with cooking spray. Spoon pulled pork on to skillet and cover bottom of skillet evenly. Then evenly pour corn over pulled pork. 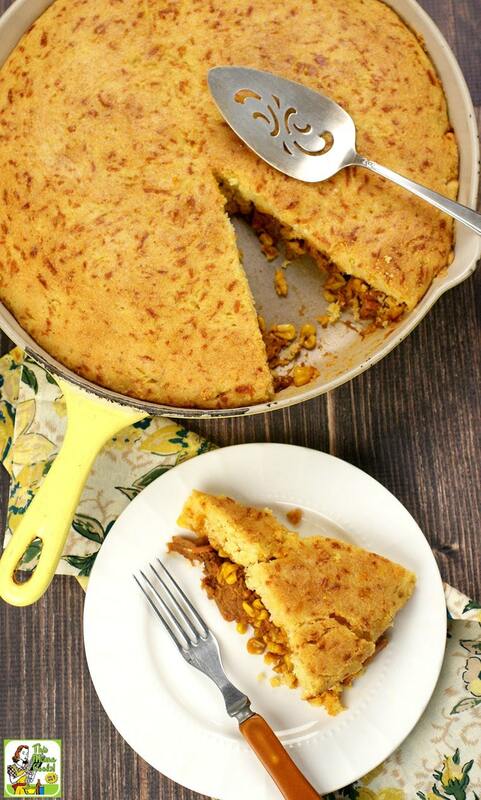 Spoon cornbread batter over pulled pork in large spoonfuls and spread evenly with a spatula. Bake for 30 to 32 minutes or until golden brown. A toothpick inserted into the center should come out clean. Originally published on September 29, 2015 and January 13, 2017. Updated with new pictures and information. Next post Make this Cabbage Roll Casserole in your Crock-Pot!